- Vol. 3, no. 30 (Aug. 26, 1942)-v. 8, no. 9 (Dec. 20, 1942). - Sometimes published as: Official daily press bulletin. - Issued for the internees at Poston Relocation Center by the War Relocation Authority. Press Bulletin . Poston, Ariz., November 5. (Poston, AZ), Nov. 5 1942. https://0-www.loc.gov.oasys.lib.oxy.edu/item/sn87062084/1942-11-05/ed-1/. 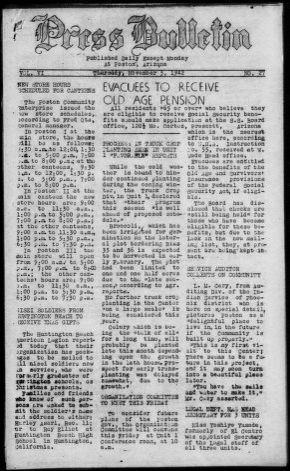 (1942, November 5) Press Bulletin . Poston, Ariz., November 5. Retrieved from the Library of Congress, https://0-www.loc.gov.oasys.lib.oxy.edu/item/sn87062084/1942-11-05/ed-1/. Press Bulletin . Poston, Ariz., November 5. (Poston, AZ) 5 Nov. 1942. Retrieved from the Library of Congress, www.loc.gov/item/sn87062084/1942-11-05/ed-1/.